CAL is independent of any government funding, has cross party support and a large number of supporters, both individuals in London and organisations. 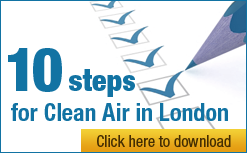 CAL provides a channel for both public concern and expert opinion on air pollution in London. This document provides both general and expert comments in response to the Consultation. Traffic is a major cause of air pollution in London, which in turn causes thousands of premature deaths per year, and many thousands more illnesses, chronic illness and disability. For this reason, traffic and cycling measures are also measures to deal with air pollution. segregated routes for cyclists. CAL estimates that cycling rates might double ‘overnight’ if people were not so afraid of traffic and air pollution*. ‘Too dangerous’ was the top reason, cited by a staggering 26%, from those expressing reasons for cycling less (slide 31). For those citing ‘Too dangerous’, explanations given included ‘Traffic too busy’ 50%; ‘Fear collisions’ 33%; and ‘Other road users’ 10%. Only segregated cycling lanes will address these problems. CAL wants the Mayor and TfL to be more ambitious. Please accelerate the implementation of the CSH, including the extensions of the East-West CSH over the Westway flyover section to Acton and the North-South CSH to King’s Cross, with their full implementation (and mitigation of any air pollution impacts) by early 2016. Mayor Johnson and TfL must be honest about the impacts of the CSH and address these in full. Any consequent increases in air pollution should be mitigated by increasing the Congestion Charge in early 2016 and bringing forward a first phase of the so-called Ultra-Low Emission Zone to early 2018. Please increase the proportion of CSH along less polluted streets wherever possible in these and future CSH schemes. The busier and much more polluted ‘Red routes’ should only be used when absolutely necessary and then with maximum protection for vulnerable road users. CAL is deeply concerned that the Mayor and TfL have not provided an ‘Integrated impact assessment’ for their proposals. The limited information available states that journey times (i.e. congestion) would worsen on some lengths of the proposed routes. Air pollution is therefore likely to increase on such roads. Of course, a major increase in cycling provision should encourage mode shift and therefore overall traffic reduction. However no quantification is provided and the projected increases in congestion imply that TfL expects broadly the same volume in traffic to use reduced road space. In CAL’s opinion, increases in journey times and congestion are highly likely to result in increases in emissions and therefore air pollution concentrations. TfL’s planned mitigation is vague and unquantified in benefit and says nothing at all about air pollution. As you know, the removal of the WEZ unwound a 10% reduction in overall vehicle kilometres after charging was introduced there (page 9 of the Integrated Impact Assessment). The WEZ consultation documents predicted an increase in journey time per kilometre of 15-21% above the night time travel rate leading to a 2-4% increase in emissions of oxides of nitrogen (NOx) and dangerous airborne particles (PM10) with about half that in terms of increased annual mean concentrations of nitrogen dioxide (NO2) and PM10 (page 23 of the Integrated Impact Assessment). warn cyclists and others about the dangers of diesel exhaust and other traffic pollution with advice for people on protecting themselves (i.e. adaptation) and reducing air pollution for themselves and others (i.e. mitigation). – First, the question in every case is simply whether what fairness requires in that particular context has been done – or (per Lord Reed) whether the purpose of any statutory duty to consult has been properly met. – Second, there is a clear need for consultation to be accessible to the people at whom it is aimed. The courts should now be less willing to accept arguments by public authorities that issues which are not addressed properly or at all in the consultation materials should be ‘obvious’ to consultees and therefore did not need to be included. – Thirdly, Lord Wilson expressly held that the requirements of consultation are more strict when what is being proposed is a reduction in services or the withdrawal of a benefit. failed to quantify the impact of mitigation measures. CAL notes anyway that the sort of mitigation measures proposed by the Mayor and TfL are needed anyway to reduce NO2, PM10 and PM2.5 concentrations in London to comply with European Union limit values and so should not be attributed separately to the CSH. CAL therefore warns the Mayor and TfL not to repeat their cavalier approach to this consultation in other consultations including the ongoing consultation about the so called Ultra-low Emission Zone.